Welcome to one of the most addictive hobbies I've ever tried. It is fun, rewarding and a great way to make new friends. I hope my page will help you to get started. 2. Gather documents with genealogy information on them. I started with obituaries I had accumulated. Now whenever, I visit relatives I ask to borrow theirs. Other helpful documents are birth certificates, death certificates, marriage license, adoption records, etc. 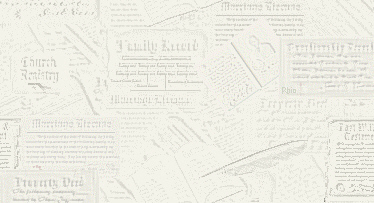 Here's some other links that will aid you help you prepare to become the Family Historian. You will also need to record what you find. I suggest a good computer program above all else. I have used Family Tree Maker for several years. I am now giving Legacy a test run since I have heard it produces nice webpages. There are also various paper records that can be beneficial. I always use my paper records to verify entries I've made into my computer program. Here are links to resources for forms and family tree software programs for you to explore. Now don't forget to visit your local library or Family History Center to check out census and other genealogical related microfilms. Most will have librarians specializing in genealogy who will be happy to help you get started. There are also census records on-line as well as other valuable genealogical records. If the county or counties you are researching are close, a visit can prove very valuable. I recently obtained about 30 death certificates for my ancestors by visiting the County Courthouse where I am researching for a nominal fee. Another resource tip that has proven valuable to me is to post queries at as many websites as possible. Check out my Queries Page for an example of one of my queries and some of the places you can post yours. The more queries you post the more likely you are to be contacted by someone with information or even potential relatives. Once you feel you have collected enough information or perhaps you might just want to use your queries, but go ahead and create a homepage. This has proven to be my most valuable on-line tool. I have been contacted by several relatives I didn't know because of my webpage. The most recent and most exciting is an Australian cousin. I hope this information helps and you find researching your roots as worthwhile as I do. This is a collection of links that can assist you with your research online.